I was Born at Mount Sinai Hospital in Toronto Ontario November 23rd 1959. I was raised in the East End of Hamilton the Steel City, far from the the treacherous Core but certainly no Paradise! Everyday smelled like a different fart from the steal mills. My parents tell me I was a horror to raise, too smart they say. Too independent and curious. Oh Yah, and always active and up to something like Dennis the Menace. I went to Roxborough Park Junior School for Kindergarten to grade three. Where I think I "might" have been a problem because I remember that teacher making me sit in a black coffin-sized closet with the door closed for extended periods of time. Then to W. H. Ballard School for Grades four to eight. It was my 4th Grade Teacher that "diagnosed" my problem as being to smart and getting bored during class. So they would give me extra challenges and activities. and from there on I became an Honor Student. Went to high-school at Sir Winston Churchill Secondary school. Where I took Automotive, Welding and Electrical but I was getting like 98% and 100% so they "threw" me out of their classes and wanted me to switch to all business courses like marketing, accounting, typing, and I loved it! Those courses in a steel-town where any 16-yr-old could make as much as his dad by quitting school and getting a job at the steel mills. 16 year-old with sports cars like 69 Camaro! So once I was half-way through, all the guys that were in the business courses were all gone and I was practically alone with all these women in every class all day long! It was heaven on earth! ;) Second, how did you become interested in computers and programming? Was it at school? Did you have a computer at home? I was first interested in electronics from a small electronicss kit that Radio Shack used to sell. From there I learned about transister computer gates, etc. which led to an interest in computers. While in highschool they allowed me to writte computer code on cards with a pencil and they would take them down to the mainframe computer at Board of Education for me. I was an honour student and was accepted to University of Wesstern in London for the business school but the more time I spent there the more interested in the computers I became. I enrolled in honours computer science. After about 3 years I was hired to work for a word processing compnay in sales and eventually ended-up at the Olivetti Sales Office in Hamilton, Ontario working my own teritory. One day I happened to be in the Personal Computer store in burlington and caught a glimps of the Atari Computer Machine. It was the first home computer with color graphics so I had to own one. I was not overly impressed by any of the games at that time so I started writing my own. My favourite games at the time were text adventures and I wrote a few of them. Then one day I had the thought instead of describing the world in the game, why not just show it. And the idea for Crypts of Terror came to light. One day I was back at the computer store looking at the games when the owner out-of-the-blue asked me if he had done something to piss-him-off. I said no, why would you ask such a question. He said well I know I sold you that computer but you never buy any games here, are you getting them somewhere else? I said no and that I was wrting games that were better than the ones he was selling. He did not believe me and demanded to see them, he probably thought I was full-of-crap. So I took in Crypts and it blew them away to the point of them starting a software firm called In-Home Software to market my games. I understand It was a number one seller for a while. 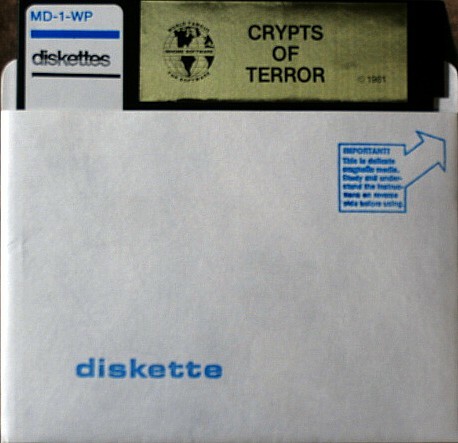 Fourth, do you remember anything about the creation of "Crypts of Terror"? What was the context or inspiration? The date I have for it is 1981: is that correct? Did you create and publish an earlier game? If so, when and which one? At the time of Crypts I was heavily into the text adventure games and thought why not take the same concept and try and visualize the Crypts and contents instead of describing them. And why not use a joystick instead of typing at the console. At the same time I saw the movie Indiana Jones which game me the idea of placing a hat on his head. A text game I wrote called Trollup's Caves was the game just before Crypts. The best game I ever wrote was Bugrunner in ROM but the company marketing it at the time folded. So it was never officially released. It was based on a mashup of Tron and Bladerunner and Adventure games. I wrote that game back in 1980. My email is RetroDan@GMail.com if you have any questions. Made right here in good old Toronto!